2. Along with covering up those bits and pieces you don’t want to expose to the rest of the beach-goers, there are other great benefits from wearing swimwear that covers you up. Another major benefit is the sun protection! Wearing that cover-up over your bathing suit or big baggy t-shirt is not going to cut it. Unless you’re wearing clothing that is specifically made to protect you from the sun, you can still get burned. Finding SPF swimwear that covers arms and legs can help shield you from harmful sun rays and reduce the risk of… dare I say it!? Skin Cancer! 3. Not only does more modest swimwear provide much needed SPF, but you’ll also save time and money applying sunscreen! That can be a hassle all in itself, and more often than not, I completely forget to reapply throughout the day and still end up burned somewhere! And if I do remember, given how much sunscreen I end up going through when spending day after day in the sun, the cost of it soon seems to feel more like an expensive smoking habit! 4. Into water sports? Modest swimwear protects you! There is a reason most surfers wear rashguards. A body banging up on a board (or heaven forbid – the reef!) all day can get bruised and scraped. I’ve gotten my fair share of rashes and burns from tubing summer after summer over the years! I don’t know why I’ve never thought to wear protective clothing for this! So, you see the many perks of wearing more modest swimwear, but still – here in lies the problem of finding it! Well, ladies! I’m thrilled to tell you about a fabulous line of athleisurewear swimwear loved worldwide. This gorgeous line of modest swimwear from HydroChic protects you from the sun, by offering UPF 50+ Sun Protection, it moves so well with the body that it’s great to play water sports in too. It also keeps you covered and feeling more confident at the lake as well! This versatile line of fun swimwear offers a huge selection of exciting new prints, beautiful colors, and cute cuts that will keep you covered but aren’t going to stand out in a bad way like that bulky T-Shirt you’ve often thrown on over your swimsuit! Theses pieces are stylish and unique, and are great quality and made to last too! I love that they have so many options that work great for mix and matching too, so you can get your own unique style and the separate pieces of swimwear that will suit you and your activities best! Hydrochic doesn’t make you choose between being comfortable or having great style – you can totally have both with this affordable line of modest swimwear! HydroChic’s swimwear is lightweight, chlorine-resistant and chlorine-proof too. It is made with a comfortable stretch fabric that is breathable, and dries quickly too! The swimwear is both ultra-durable and super-flexible as well! I recently got to try out a couple of my favorite pieces from the ultra-chic line of modest athleisure swimwear! 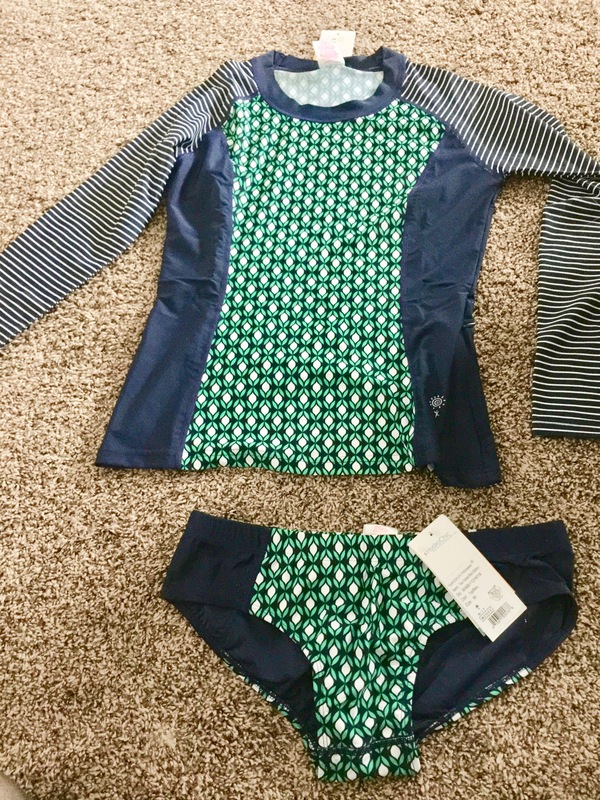 Check out my cute matching Two-Toned Bikini Bottom and Slim Fit Rashguard below! Super cute pieces right? I love the rash guard style top for paddleboarding, wake-surfing, wakeboarding, and my other watersports I love and enjoy and participate in all summer long! I really love that the top comes with a separate sports-bra top which gives my small A Cup Chest some shape, AND helps me move freely and comfortably while cutting back and forth across the wake on my wakeboard! Interested in checking out some of these great modest swimwear pieces for yourself? What swimwear would you choose? Let me know in the comments, I love hearing from you! Don’t forget to follow MyStyleSpot on Twitter and Instagram stay up to date on all things fashion and style! I love this suit, and I use so much sunscreen every day, I think it is a good idea to be more covered up for health and modesty, too. You’ll never regret being more modest! It’s FAB for sun protection! HydroChic’s swimwear looks very comfortable & it’s great it helps protects against sunburn. I love the top with the longer sleeves! I really like these suits. Sometimes you go to the beach/pool and all you see is a string going up their bottom. I heard a little boy one time ask why he had to wear a suit if that woman didn’t have to. I would choose the one you are wearing. It’s really nice! The best looking swimsuits actually have more coverage than some of the most popular ones. Even when I was younger and had the figure for a bikini, I just never felt comfortable wearing them. They are so revealing, and even a tiny movement can make something shift. I think having a suit you can feel comfortable in is so much better. Love the colors on this one! How awesome! I too grew up in a home where it was not an option to wear very revealing clothing, especially for girls. My mom always had me wear a tee shirt over my swimsuits, and sometimes a little skirt. But these are fab, My favorite is the Chlorine Proof Geometric Short Sleeve Swim Dress & Cover Up. Beautiful, in AND out of the water, and the chlorine won’t get to it. SUPER, just in time for summer, yay! I agree that the bathing suits today not pretty at all. Thank you for sharing this article. HydroChic’s swimwear looks very comfortable and stylish, especially for someone my age! I am so glad that you have other attractive prints than stripes! Also I like that I can put together my own flattering suit and that I am not forced to buy a whole swim suit just to pick out the piece that I want! I like the Plus Size selection. It looks flattering! I have had a lot of health issues that have ended up in surgeries. My body’s torso looks like it’s been sliced and diced! I love the breathable fabric and the sun protection capabilities! I am religious and even when I wasn’t, I didn’t appreciate being looked at like a piece of meat! I didn’t like this for my daughters either! I agree with modest clothing. I actually think women (and men) present themselves better. I can only imagine trying to find a prom dress, that would be hard. So many of the dresses are waaaaaaaaaaaaay to revealing for girls that age, and there is really no need for i.